Well, I’ve done it again. In an attempt to simplify my life … I made it more difficult! It’s December – Christmas prep, shortened daylight hours, more cumbersome chores, etc. I decided to abbreviate a workout session in lieu of long walks. 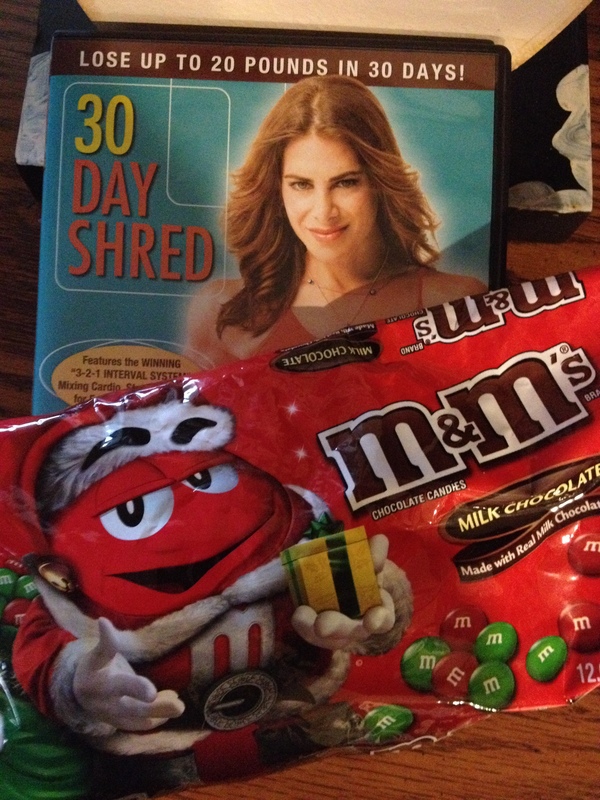 I ordered Jillian Michaels’ 30-day Shred DVD. Just 20 minutes! Three levels of intensity to choose from. Two minutes of warm-up and two minutes of cool-down. So, I’m actually only working out for 16 minutes! No-brainer. Bring it on and let’s get crackin’. Let’s whip this Christmas cookie body into shape! Now, I’m no dummy. Even though it is only a 16 minute workout, I chose to start with Level 1. I mean, if I found it not challenging enough, I would just skip ahead to Level 2 the next day. I was impressed. Jillian crams a lot into 20 minutes. The two minute “warm-up” had me breathing a little harder than I thought a warm-up might. Oh well, only 18 minutes to go. Squats? I despise squats. Pig-farmer lifts weights and nags encourages me to lift with him. One day I did. He started me right off with squats … using a weight bar … no weights. But the dang thing weighed 25-lbs or more all by its horrible self. I could not walk right for a week after. AND I had a parade to walk in the next day! But, I figured I would try Jillian’s squats with my little ol’ 2-pound dumbbells. Dumbbell is right! Jillian gave a shout-out – “It will be getting easier for you on about Day 5 or 6! !” Yes, because you quit! Oops, dumbbells just slipped outta my hands and hit Jillian’s face. After I was done, I felt good! Accomplished! Quick shower and on with my day. Legs only a tidge wobbly. Not bad. I knew I was in “decent” shape. Everyone recognizes “stuffed-teddy-bear” as a shape, right?? By that evening I was getting a little stiff. That’s okay. I’ll loosen up in the morning. Maybe walk a little on the treadmill at a slow pace before working out. The next morning my legs buckled when I slid out of bed. I found bending down to pick something up a little painful. I told myself it would feel better after I did chores. I forgot. I lift with my legs to prevent hurting my back … safety first, you know. The animals gave me quizzical looks as I moaned. Oh holy heck! By noon my thighs had atrophied into cramped balls of pain. Just standing up or sitting down made me whimper. All bundled up to do chores in boots, coveralls and hooded coat I figured people driving by probably felt sorry for the old, hobbled, man/woman out there doing chores. By evening, I returned home in the dark from an errand and saw I left a light on upstairs. As I took the first step, I cried “Oh Holy Night! !” I pacified myself by coming up with a new expletive for each step up and down. If nothing else, I’m creative. Finally, ready to relax on the couch. Popcorn? Check! Hot chocolate? Check! Blanket? Check! Cell phone nearby? Check! Mystery book? Check! Aaaahhhh….warm and comfy. Five minutes later – it hits me. I have to go to the bathroom. All that water I drank to wash down the ibuprofen was coming back to haunt me. Finally, I gave up and went to bed. As Scarlett said, “Tomorrow is another day.” I like Scarlett much better than Jillian. This entry was posted in Exercise and Motivation, Holidaze and tagged chores, exercise, Jillian Michaels, M&M's, Pig-farmer, squats, workout. Bookmark the permalink. 12 Responses to Take this, Jillian Michaels! Synonyms for shred (verb tense): rip, tear!!!!! Reminds me of a time (many years ago) when I volunteered to help measure long jump distances at my daughters track meet which involved a lot of squatting. I swear every chair and seat shrank several inches the next day. You know it was bad because I can still remember that pain!! haha! Are you putting yourself through the shredder again today Crazy Mom???????????? LOL! I took yesterday off and am fearfully contemplating it. Not brave enough yet, though. It is a pain you remember, isn’t it!?? Marla – I’m thinking you should E-A-S-E into this workout routine. Maybe do 10 minutes a day for a week or two before you attempt to do the whole 20 minutes. Maybe you wouldn’t hurt yourself as bad and need all that comfort food as a reward. I laffed at you but I promise it wasn’t an evil laff. You are right about easing into it! I’m going to shoot for every other day for awhile. I’ve done it twice now! And you are still walking! P.S. Will you be joining the Pruemers for Christmas? We’ll be there and I’d love to see you! Yes, we’ll be at the Pruemer Christmas. I’m excited to know that you’ll be there, too!! Great idea. So many stars for the amount of stars you may see upon using the muscles a day later? I feel your pain! Take two M&Ms and call in the morning? LOL-stuffed-teddy-bear shape–sounds all too familiar! I haven’t given up quite yet. I’m going to try to complete it a couple times a week. But, the M & Ms are a given! Good for you! It’s surprising how quickly our bodies improve, Marla. What seems difficult the first time gets a little easier with each subsequent try.